Where does the time go, y’all? Can you believe we’re just 15 days away from Christmas day? 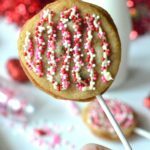 The holidays always have a way of sneaking up so quickly, and this month my kitchen has been overflowing with all sorts of holiday making, baking and tasting! 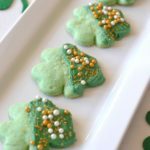 I’ve made cookies and candies a-plenty, but this past week I made a sharp turn from all of the sweet confections and jumped right back into game-day mode! If you’ve been following college ball, you know there have been some pretty big bowl games happening lately. From regular season games to rivalry games and playoffs, we’ve been glued to our big screen watching our team dominate on the field. After our big win last week, we’re we’re not finished yet! 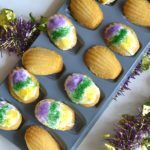 Our team is going the distance with a national championship in sight, and I’ve been keeping my head in the game with lots of yummy game-day snacks that are definitely going to bring home that “W” with our taste buds! When it comes to game day eats, we like foods that pack in some big flavors without the need for using utensils. Grab and go foods allow us to keep our eyes on the game so we’re catching every play that’s made! Tacos have always been a popular game-day food in our house, but I was always a little put off by how easily they fall apart. It’s no fun dripping taco meat and toppings all over your shirt when you’re trying to watch the game. 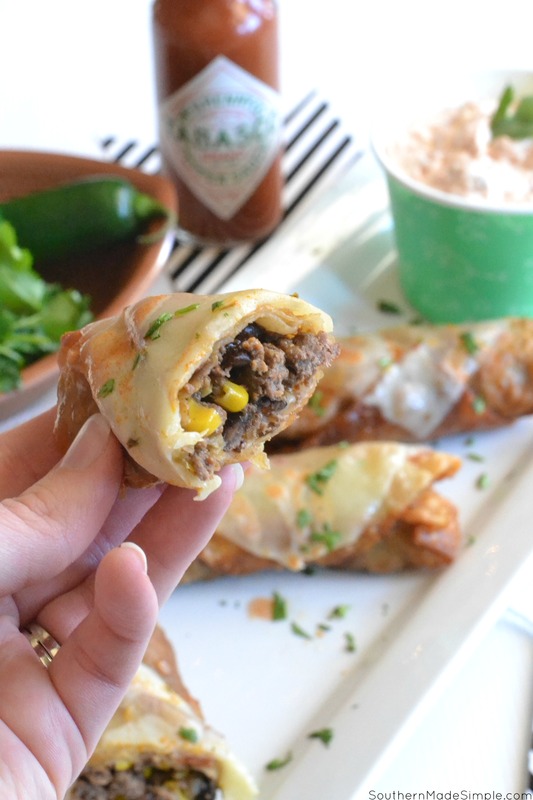 That’s where my idea for these Touchdown Taco Egg Rolls came into play, and they were a total game changer! 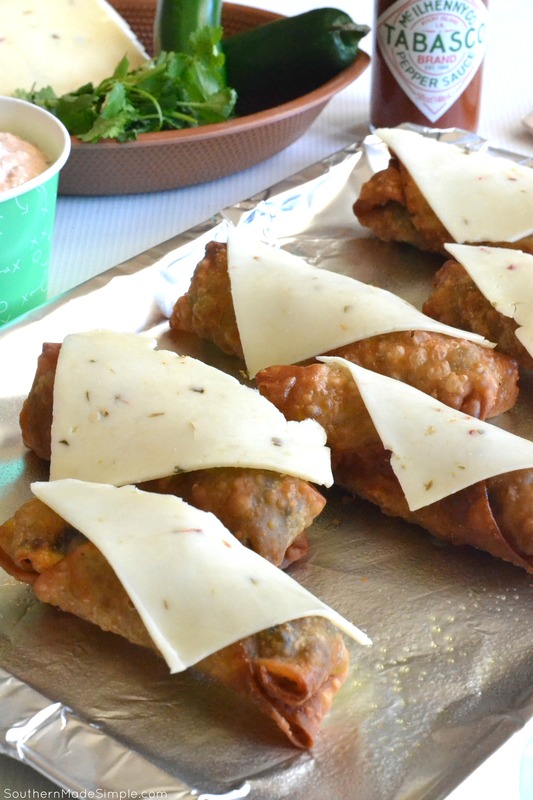 What better way to keep all of that taco goodness confined in one place than by frying it up inside a flaky golden egg roll? 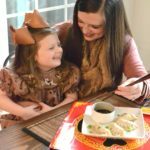 The egg roll wrapper may seem like a strange choice for a food that is typically served in a tortilla, but trust me on this one, guys! 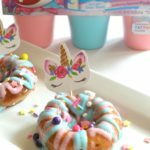 It’s a fun food pairing that is definitely sticking around in my house! When I’m preparing taco meat, I like to enhance the flavor with a few douses of TABASCO® Brand Pepper Sauce. 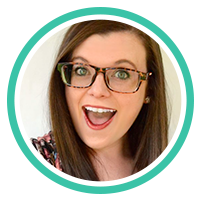 I’ve been using it to add a bold element to my cooking ever since I can remember, and you can always find a bottle of it on my kitchen table for people to use at meal time! 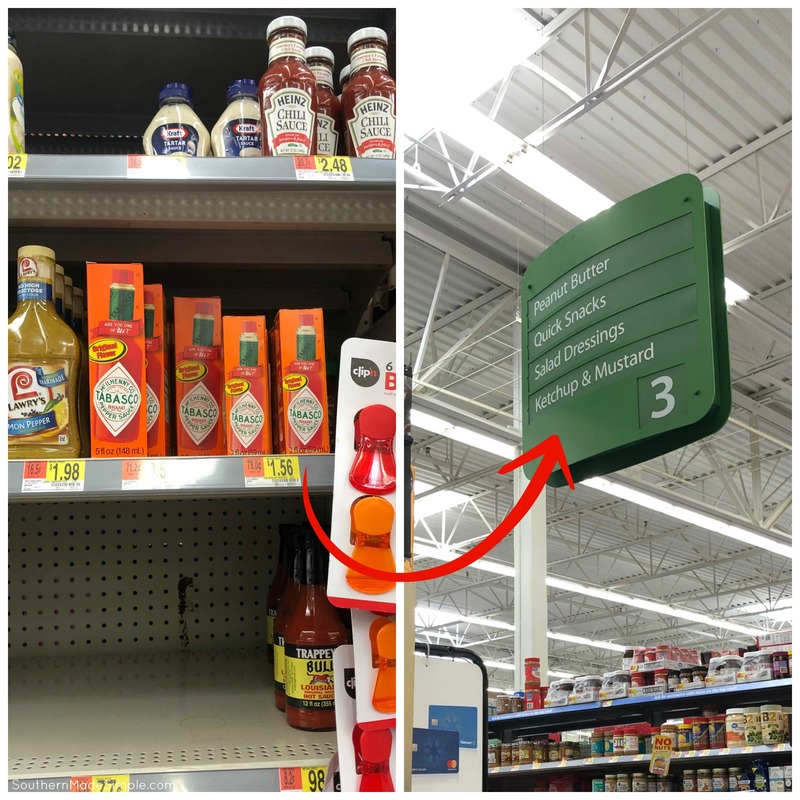 Next time you’re at Walmart, swing by the condiment aisle and grab a bottle or two for your household to enjoy, too! In additional to Original Red Sauce, you can find TABASCO® pepper sauce in a variety of flavors – such as TABASCO® Chipotle Pepper Sauce and TABASCO® Green Jalapeno Sauce. When preparing taco meat in our house, I like to add in a few extras to give it a little oomph. 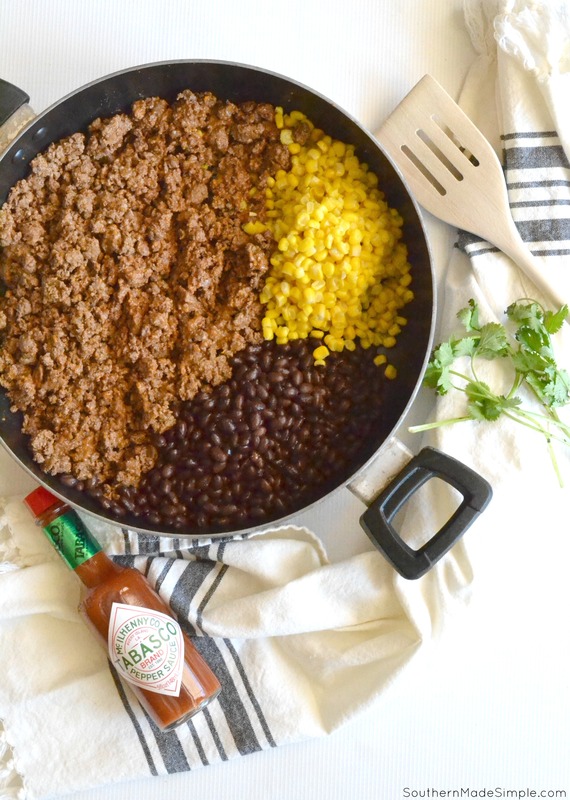 I add in some corn, black beans and a little TABASCO® pepper sauce to bring the flavors to life. Did you know that every bottle of TABASCO® Brand hot pepper sauce comes out of Avery Island, Louisiana? Louisiana is known for the bold flavorings in their food, so it’s no surprise that a sauce this delicious hails from there! The Original Red Sauce is made with just three ingredients: aged red peppers, salt and distilled vinegar. Its simple ingredients make it incredibly versatile, so it can be used in just about any dish you please! Plus, it’s non-GMO, gluten free and has zero calories. Adding it to your game day food is a winning play – no doubt about it! 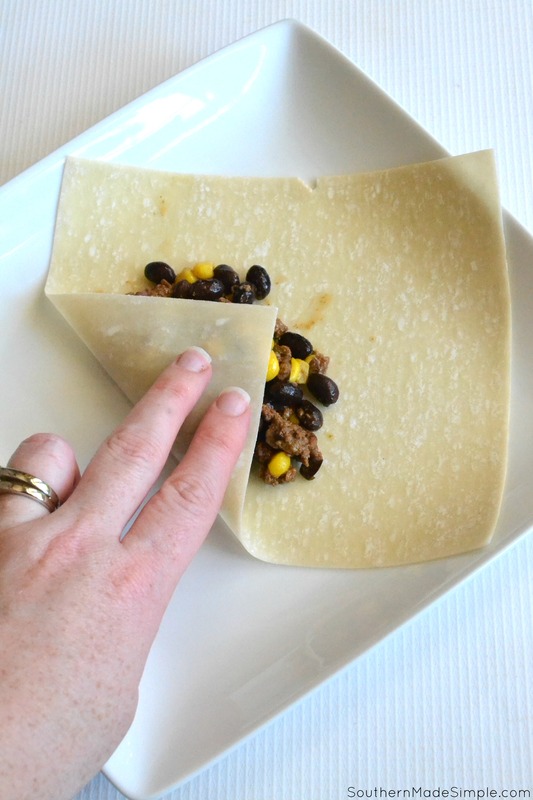 To make the egg rolls, I spoon a little bit of the taco mixture onto each wrapper and roll/fold according to the package instructions. Once I have the egg rolls stuffed, I drop them into the fryer for about 3 minutes, or until they’re perfectly golden. Once they’re out of the fryer, I set them on a paper towel to drain off excess grease and lined a baking sheet with foil. I cut a few slices of pepper jack cheese in half and placed them on each egg roll. I popped them into the oven for just a few minutes to let the cheese melt before serving. 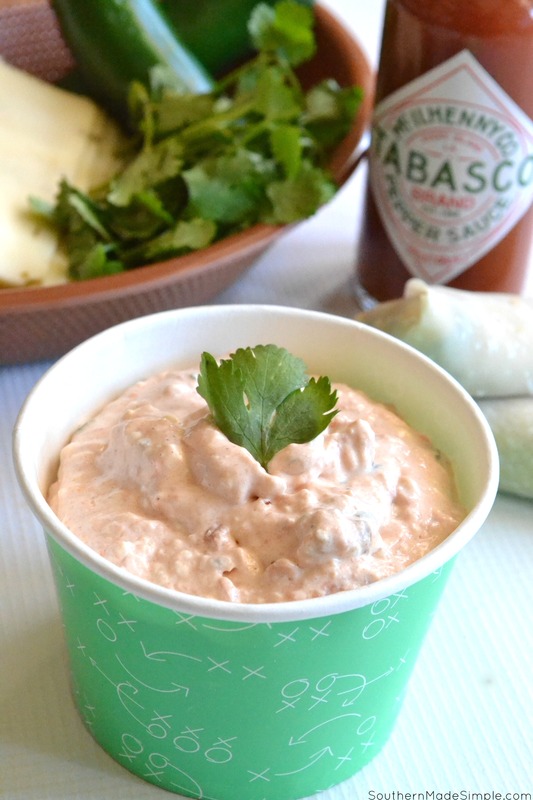 I also whipped up a quick and easy creamy salsa dip made with TABASCO® pepper sauce to serve with the egg rolls. This dip almost didn’t make it onto the plate because somebody (it was totally me) kept sampling it with tortilla chips while the egg rolls were in the fryer. I couldn’t help it….it’s crazy good! While may people may think it’s crazy to celebrate the holiday season by watching football, I honestly can’t think of anything else I’d want to do right now! 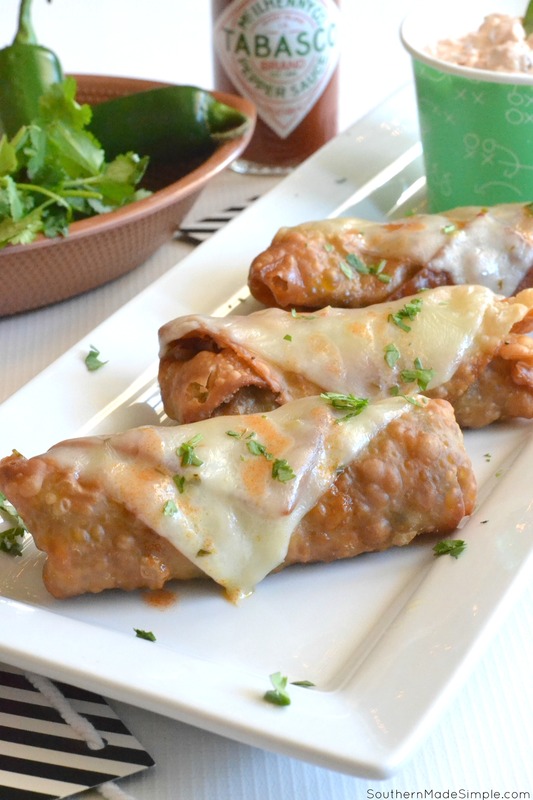 Sitting down with a plate full of these Touchdown Taco Egg Rolls and watching the game is better than any present under the tree in my opinion, and my family can’t wait to chow down on these bad boys again as we watch our team compete in the next bowl game coming up very soon! What types of game day foods do you like to serve your family? 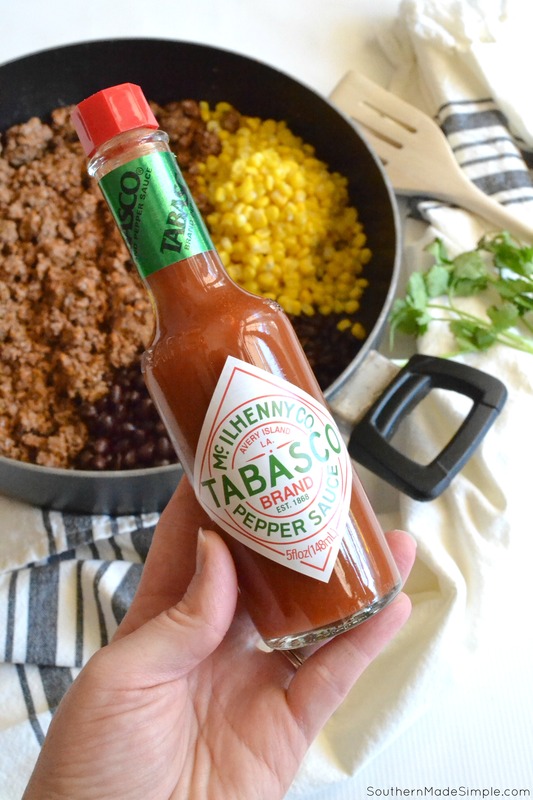 Do you like to add a little TABASCO® to help enhance the flavors in your cooking? Don’t forget to take advantage of the Ibotta offer to earn a little cash back on your TABASCO® purchase next time you’re at Walmart! Leave a comment below and share what game day creations you’re feasting on this holiday season!